This year marks the fiftieth birthday of the Society for Medieval Archaeology. 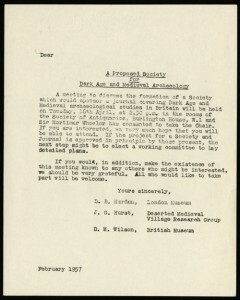 It was on the afternoon of Tuesday 16th April 1957 at Burlington House, Piccadilly, that Donald Harden, the newly appointed Director of the London Museum , first outlined proposals for a new ‘society for Dark Age and Medieval Studies’. The idea was a simple one; a new society with a new journal, occasional meetings and an annual conference, all to be dedicated to the period ‘from the end of the Roman period until the end of the Middle Ages in Britain, but not neglecting the Continent and not being too exclusive in period or subject matter’. There was warm support that day among the 85 people present and, under the chairmanship of Sir Mortimer Wheeler, the motion to form a new period society was carried by an overwhelming majority (Figure 1). Rupert Bruce-Mitford, Keeper of British and Medieval Antiquities at the British Museum, became the Society’s first President and within two years membership was already nearing 500. 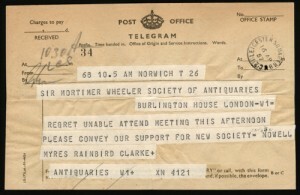 Figure 1: Support for the Society came from all parts of the archaeological community. Here Rainbird Clarke, celebrated Norfolk prehistorian, and Nowell Myres, the Anglo-Saxon specialist, add their weight to the proposal. Clarke was then Curator of the Norwich Museum and helping Myres in his analysis of pottery from East Anglian cemeteries (SMA archive). It had not merely been a case of coming up with the idea and putting it to the vote. Informal correspondence about the formation of a new Society had been underway for about six months between Harden, excavator of Anglo-Saxon Abingdon, John Hurst, then a 30-year old Assistant Inspector of Ancient Monuments at the Ministry of Works, and David Wilson, Assistant Keeper at the British Museum, and ‘they had agreed to pool their plans’. There were precedents, of course, the Society for the Promotion of Roman Studies had been formed in 1911 and the Prehistoric Society of East Anglia in 1908 later became the Prehistoric Society in 1935, so this was the third of the period societies to be established. Even so, there were new challenges to be faced. ‘There should be cooperation with Historians, Geographers and Architects’ wrote Hurst in December 1956, setting out their joint aspirations ‘so that the whole field of medieval studies can be covered. It is hoped to increase still further the links which are beginning to form after such a long dichotomy between Archaeologists and Historians.’ As Harden put it at the April meeting ‘we must keep in touch, not live in a watertight archaeological compartment’. It must therefore have been gratifying to see just how supportive the archaeological community as a whole were towards the venture (Figure 2). It is a symptom of the age that most of those in senior positions were men, though Beatrice De Cardi represented the CBA and Rosemary Cramp, then a Lecturer in Anglo-Saxon Antiquities and Archaeology at the University of Durham, was also among those present that April day. Today all major archaeology departments have someone in post specialising in medieval archaeology, with undergraduate modules and postgraduate programmes to match, but in 1957, it must be remembered, academics specialising in medieval archaeology were few and far between. Talk of ‘petrol rationing’ and ‘telegrams’ of support are a reminder of the national context surrounding these events. This was the year that Eden resigned as prime Minister, the Treaty of Rome established the EEC, Sputnik was launched, and Eisenhower was in the White House. The piña colada was also first concocted in 1957 (hardly the archaeologist’s preferred tipple then or now, but if you have to share your birthday…), not that medievalists had time to take note. This was a time of tremendous growth in the subject. 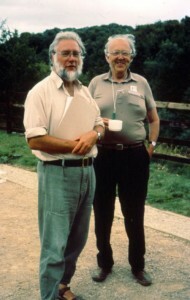 Figure 3 John Hurst and Maurice Beresford at Wharram Percy in 1989 for the presentation of a volume of rural studies dedicated to them (Photo: Mick Aston). The seeds of the Society had been sown before the Second World War with excavation campaigns at Sutton Hoo and innovative finds work such as that by John Ward Perkins for the London Museum Medieval Catalogue (1940). Excavations by Edward Leedsat arural settlement at Sutton Courtenay (Berks.) in the 1920s had been pioneering (Harden ensured that his mentor’s posthumous paper was the first in the Society’s journal) as were Jope and Bruce-Mitford’s experiences of urban ‘rescue’ archaeology on the site of the Bodleian Library extension in Oxford in 1937. Sites like these demonstrated that results were possible on the most unpromising of sites and their value was seized upon by historians like Michael Postan and Eileen Power (close collaborators in setting up the Economic History Review in 1927), just as geographical techniques were being adopted by those with landscape interests. 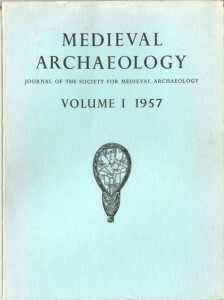 While it is true that medieval archaeology at the time was being written almost entirely within a documentary framework, this blurring of strict academic ‘genres’ became a real feature of the post-War period as the Victoria County Histories combined the study of documents, now more readily available in expanding record office collections, and earthworks in the developing arena of field archaeology aided by new initiatives such as the revival of the archaeology branch of the Ordnance Survey (1947) and the National Buildings Record (1940), which focused minds on the surviving post-War stock of medieval buildings. As field archaeologist O. G. S. Crawford wrote in his manual Archaeology in the Field (1953), referring to the study of documents and visible remains: ‘the student must be at home in both spheres and whether he is called a field archaeologist or historian is a matter of words; he must be both’. Popular interest in local history, fed by new university extra-mural departments, typified this more multi-disciplinary approach and was consolidated by the enormous success of William Hoskins’ The Making of the English Landscape (1955), the impact of Finberg’s history of Withington (Glos.) and Maurice Beresford’s History on the Ground (also 1957). Their approaches were to prove hugely influential on later practitioners and, in the year 1957 we have a real sense of a subject ‘in the making’. Medieval Settlement Research Group), the original idea for which had arisen from discussions at Wharram in August 1952 (Figure 3). One early focus of interest was the moated site but soon all kinds of deserted settlements began to receive attention, including farms like Upton (Glos.) and hamlets such as Hound Tor ( Devon ). In the same year the Vernacular Architecture Group was formed and its members were also soon producing substantial regional and national syntheses, an early model for which was Cyril Fox and Lord Raglan’s well illustrated analysis Monmouthshire Houses (1951-4) which brought an archaeological eye to architectural problems. Other groups followed over the years: the Medieval Pottery Research Group (1975), the Finds Research Group AD700-1700 (1983), the Castles Studies Group (1987) and a new Society for Church Archaeology (1996). The contribution of these ‘groups’ is a rather unusual (and British) feature of medieval archaeology as a whole. The reason for their obvious success lies in the tight focus they provide for debate and publication on specific topics, not to mention field trips and workshops. At the Burlington House meeting, Harden had presented a vision of a journal for the Society of 160 pages and 16 half-tone plates at crown quarto size. Mrs Wilson then worked up rough layouts for a possible cover for the new steering committee consisting of Harden, Hurst, Wilson, Bruce-Mitford, Herbert Finberg (Head of English Local History at the University of Leicester) and C. W. Phillips (Ordnance Survey). Eric Fletcher was co-opted to advise on legal matters. Oddly enough, it was not the format of the new journal which exercised the committee, it was its title. During discussions the previous year Harden had liked BRITAIN A.D. (though this would inconveniently include Roman matters), Wilson meanwhile preferred something Latin such as Acta Archaeologica Medieval while Gerald Dunning plumped for the Journal of English Society though others felt this had too much of a literary flavour, Cambridge prehistorian Grahame Clark suggested the Journal of Dark Age and Medieval Studies but Hurst thought this just too long and wasn’t in favour of the term Dark Age. Hurst ’s own alternative, the Journal of Saxon and Medieval Archaeology, had the disadvantage of excluding the Celtic west and was therefore considered divisive. By mid-May 1957 the picture was confused further by new suggestions: Alfred was one, Monumenta another and the Journal of Post-Roman Archaeology a third. Figure 4 The very first Journal edited for the Society by Donald Harden, and the 50th anniversary volume. As part of the Society’s 50th anniversary activities the first fifty issues will be made available online. The name of the Society too was proving troublesome. At its May 1957 meetings the steering committee charged with the task felt that the Society for Dark Age and Medieval Archaeology was not ideal, but the best of the bunch. Finberg, however, strongly disagreed and threatened ‘a vulgar brawl’ were the matter not to be resolved. He found the proposed title ‘lamentably imprecise’, the term Dark Age ‘defeatist and depressing’, the Renaissance division of the historic process into ancient-medieval-modern ‘obsolescent’ and ‘as a title for the society, it is both cumbrous (17 syllables!) and slipshod (an adjective coupled with an adjectival noun)’. Unfortunately, even Finberg had to confess that he could think of little better. The Society for the Study of Post-Roman Britain was his choice, with LUCERNA, A Review of unwritten evidences of British History since the Roman period being his selection for the journal title (a title he was later to re-cycle in 1964). In spite of Finberg’s considerable experience in publishing (he had worked with Basil Blackwell and launched the Agricultural History Review), the rest of the steering committee resisted Finberg on the grounds that ‘post-Roman by itself gives a feeling that it will be confined to immediately post-Roman times’, a reaction which Finberg found ‘disappointing’. Nevertheless, his point was made and the steering committee now returned to one of the original suggestions for its name, the snappier Society for Medieval Archaeology, and then opted for Martyn Jope’s proposal for a Journal of Medieval Archaeology (Figure 4). Whereas prehistoric and Roman archaeology was damaged by mineral extraction and motorway corridors, in the 1960s and 1970s it was the regeneration of Britain ’s cities which was of most immediate concern to medieval archaeologists. Inspired by post-War urban campaigns such as those by William Grimes and the Roman and Medieval London Excavation Council (1946-62), large-scale urban excavation in London , York and Southampton, among others, now transformed our understanding of 7th and 8th century ports and trade. Other notable milestones included the exposure of the first later medieval waterfront at King’s Lynn in 1964 (the subject of the Society’s seventh monograph), excavations in the walled town of Perth with its excellent organic preservation (see ‘Birthday treats’) and the technical and research standards set by Martin Biddle and his teams working in Winchester in the late 1960s. Of course, any innovation should only be assessed within the matrix of funding and legislation of its day. Today, in a archaeological world so influenced by planning policy guidance where ‘research excavation’ is a minority pursuit, excavations on medieval sites are frequent but tend to be smaller in size (though there are exceptions of course). The annual county-by-county summaries of recent work in the Society’s Journal, for which there are plans afoot to go online, demonstrate these trends very clearly and reveal how commercial units are rising to the challenge of integrating their developer-funded excavations with broader research themes. Another more recent legislative change in Treasure Trove law brought about the Portable Antiquities Scheme, a voluntary scheme to record objects found by members of the public, mostly metal-detector users, which has begun to change the distribution of some finds types in startling ways, particularly for so-called ‘productive sites’, inland markets of the 7th to 9th centuries. Again, the distinctive pastel blue Journal now provides an illustrated annual summary of medieval finds from the Scheme. Another major step change has been the application of new techniques such as systematic fieldwalking, or ‘sherding’ as it was referred to by members of the Oxford University Archaeology Society undertaking their first parish surveys in the mid-1960s, which has vastly improved our understanding of the development of the medieval rural landscape. Maurice Beresford, meanwhile, was making use of aerial photography in his search for ‘lost’ villages’ as early as 1947 while geophysics became routine only once data processing speeds and monitor displays improved in the 1980s (the Society is actually one year older than the term ‘software’!). Open-area excavation such as that undertaken at the Templar preceptory at South Witham (Lincs.) was one innovation of the 1960s (Figure 5), the routine study of faunal and botanical remains was another, but every part of the discipline has been transformed. Long-running projects like that directed by Andrew Saunders at Launceston Castle in Cornwall not only endured methodological change, such as the switch from notebook recording to context records in the 1970s, but also came to adopt a new landscape dimension in its research design (Figure 6). Elsewhere, dendrochronology has had a huge impact on the dating of roof-types and waterfronts (and therefore artefact sequences) while the recording and interpretation of earthwork sites and buildings undertaken by the former Royal Commissions and in particular those supervised by Christopher Taylor are both admired and influential. summarise the developing interests of the medievalist? First, most medieval monument types have now been examined in some form, moving well beyond ‘high culture’ and the ‘aristocratic’. One practical example of this is the priority now given to the full range of rural settlements such as farms, hamlets and shrunken villages, for example in the Whittlewood Project, but it is also the case that medieval archaeology today is more inclusive in its concern for all parts of society including the identities of understudied ethnic groups and gender domains. Second, hitherto understudied aspects of monuments have come under the spotlight, for example, Bill Klemperer’s recent monograph for the Society on his excavations at Hulton Abbey (Staffs.) reveals entirely undocumented aspects of the environment and economy of the Cistercian abbey there. Third, many research-led projects might be described as ‘multi-disciplinary’; few could now exclude complementary documentary study and they will often include studies of buildings, historical ecology and the environment. Fourth, there is greater appreciation of the social and symbolic significance of landscapes, buildings, settlements and objects. Recent re-interpretations of the architecture and use of ‘designed’ space at castles such as Bodiam ( Sussex ) are one specific example of the changing debate, another is the recognition of the 15th and 16th centuries as an important time of transition in patterns of consumption and behaviour. The latest social and theoretical approaches are always reflected in the Society’s thematic conferences and their subsequent publications (most recently on early medieval burial, Viking Studies, Scottish early medieval sculpture and on interconnections between town and country). That said, it would be unfair to come away with the impression that medieval archaeology is constantly at the mercy of technology, theory and politics. A sure sign of the growing maturity of the subject is the number of recent syntheses and the progressive move away from an implicit historical framework towards a more archaeological perspective. There are also a series of long-term projects which quietly continue to catalogue and classify medieval materials to the very highest standards, the Corpus of Anglo-Saxon Stone Sculpture being one, the finds volumes published by the Museum of London Archaeology Service being another. All these trends can be seen unravelling in the Society’s Journal highlights over the years, with views, issues and current events being highlighted in its newsletter since 1990. Less obvious perhaps, is the impact that the Society has had further afield. In his first twelve months as Treasurer to 1959, Hurst was surprised to find himself battling with the vagaries of international finance and postage as enrolments came in from as far afield as Australia , Denmark , Germany , Hungary , India , Italy , Spain , Sweden and the United States . Today the Society still has many foreign subscribers and has inspired the creation of similar societies in France, Germany, Italy and Spain.